Designer Christine Lin, founder of Form + Field, studied architecture in college before a “long detour through the tech industry” as she puts it. Eventually she decided it was time to follow her passion back into interior design. A recent project was for a young couple who have great design sensibilities (she’s a graphic designer/ art director) and a love of both Scandinavian and mid-century design. 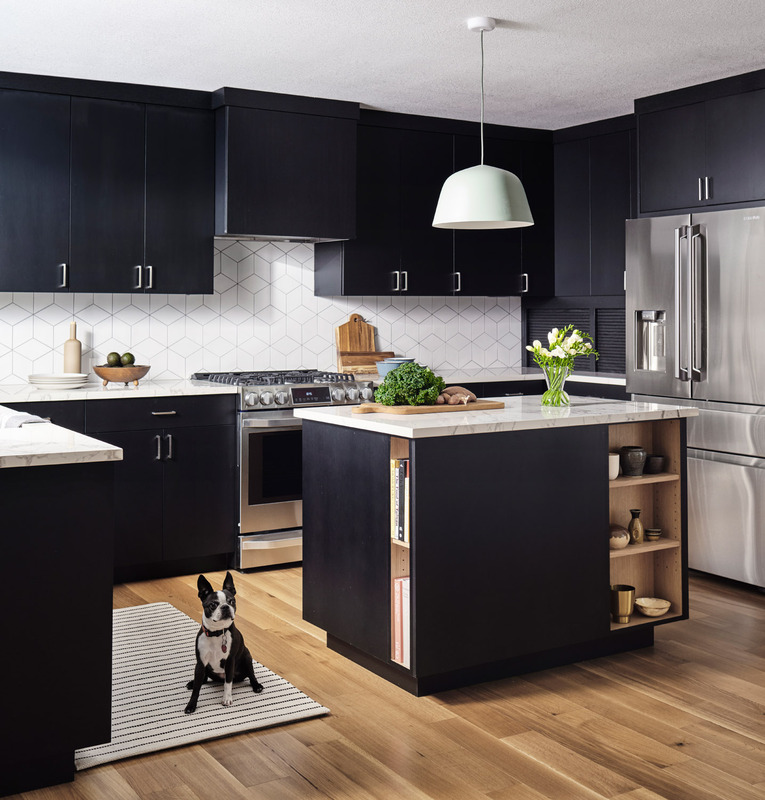 The entire home is designed for durability with pets and future kids in mind (you have to see their Boston Terrier, Professor, in the slideshow!) 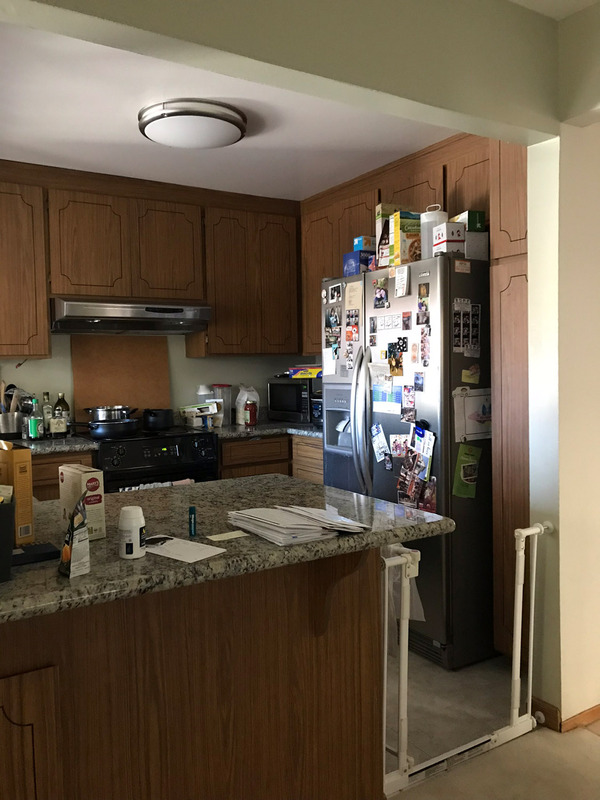 The kitchen in particular needed to function well for two passionate cooks – a gas stove, plenty of space for people and appliances, and a counter that could handle hot pans. 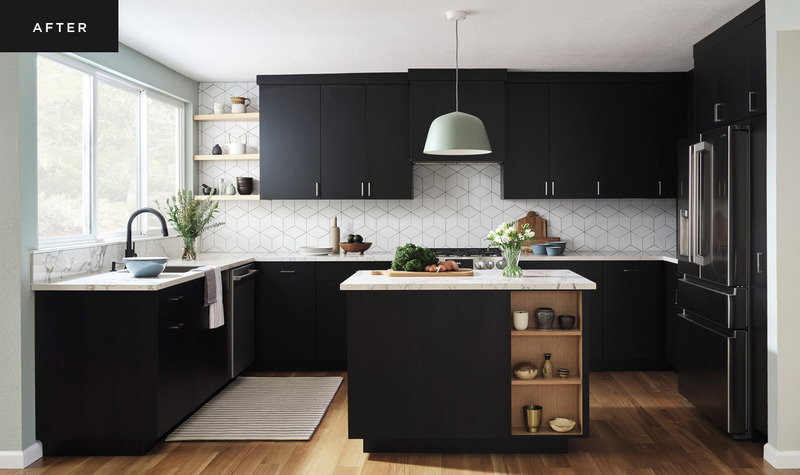 We can’t get enough of this kitchen, so we asked Christine to share her advice for designing a Scandinavian inspired kitchen. See her tips below and the whole home in the slideshow! Incorporate natural wood.Natural wood is commonly used in Scandinavian interiors and creates a more indoor/outdoor feeling that is perfect for modern homes. It’s also durable and wears in well over time. 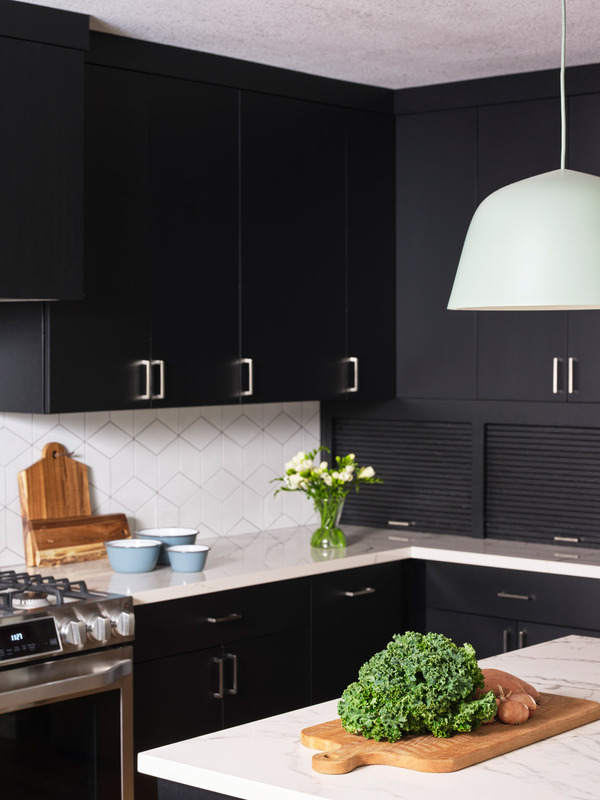 Consider stained cabinets that show the wood grain in lieu of painted cabinets – in this kitchen we stained the cabinets black. We brought in natural wood through the oak flooring and the oak shelving on the wall and in the island. Keep the cabinets clean and simple.We created a lot of functional storage in this kitchen with the cabinets and appliance garages, but at the same time the cabinet sizes selected were very intentional to create symmetry and balance around the range. Upper and lower cabinets line up which contribute to the elegantly clean-lined and minimalistic feeling so much appreciated in Scandinavian design. Bring in pastels.While whites, blacks, and grays are common in Scandinavian homes, they’re also known for their use of pastel shades. Bring in pale colors to keep the vibe subdued and peaceful. 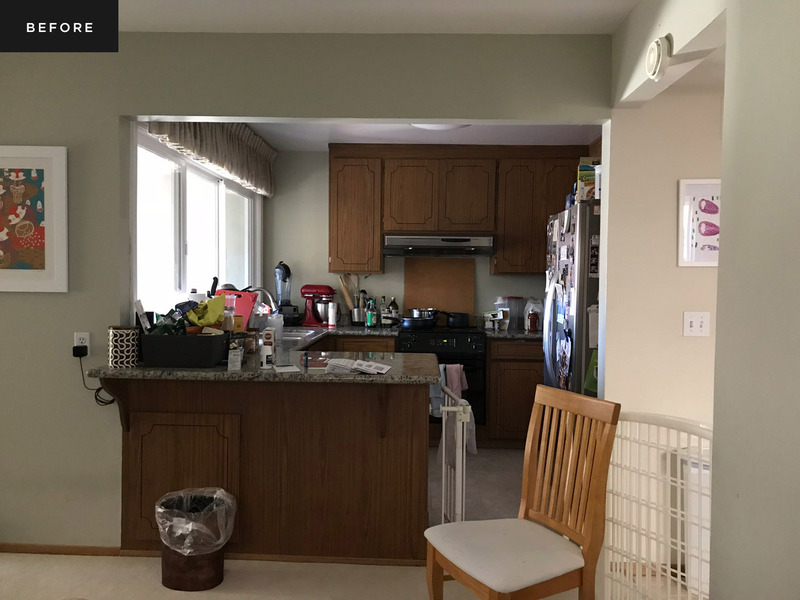 In this kitchen, we brought in a sage green through the lighting and the wall paint which adds just the right amount of color to the black and white kitchen. 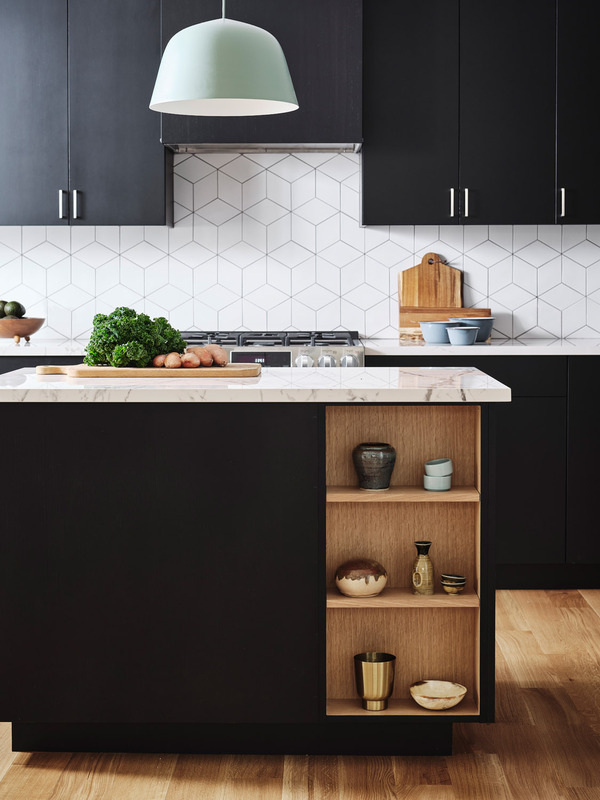 Add a graphic pattern.Graphic patterns are popular in Scandinavian design and the kitchen backsplash is the perfect place to indulge in one! 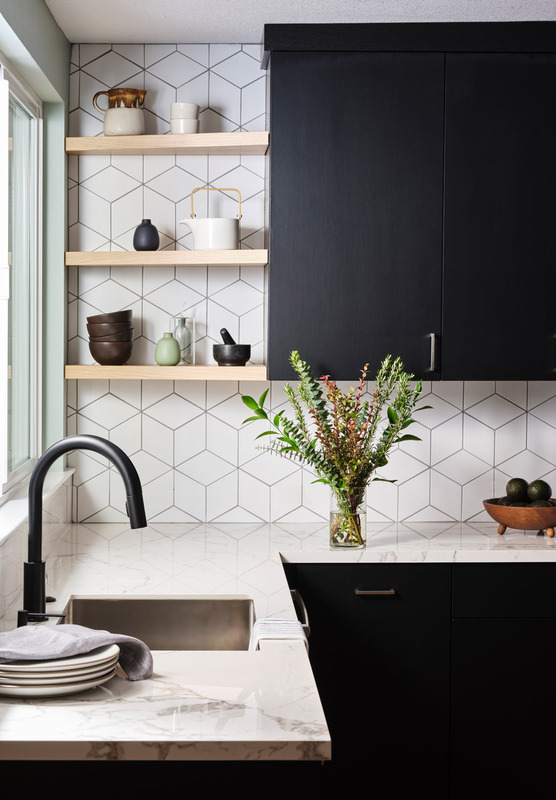 In this kitchen we selected a rhombus-shaped tile that adds an interesting pattern to the kitchen, but is still in keeping with the peaceful vibe because of the subtle gray grout. The gray grout is also practical in that it hides stains! Consider porcelain countertops.We love the porcelain countertops used in this kitchen for several reasons. 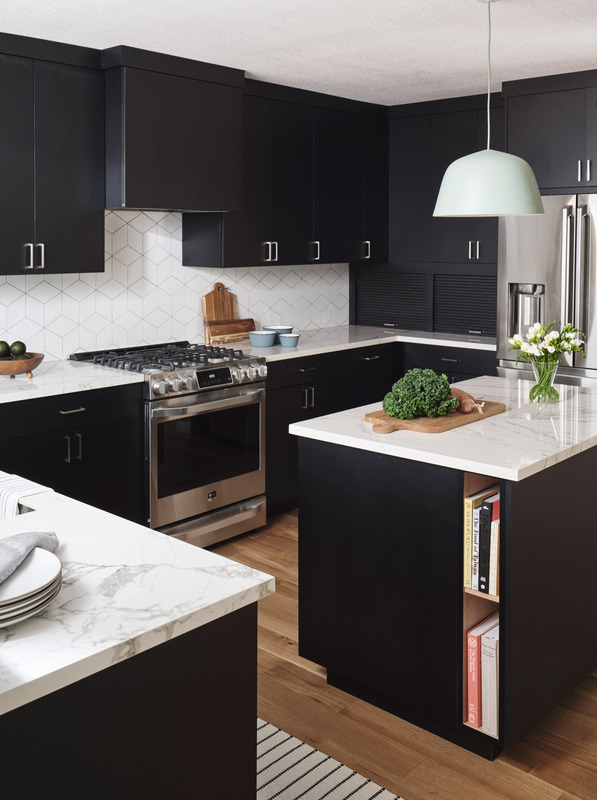 They create a believable marble look without the maintenance (in contrast to quartz countertops). They’re extremely tolerant to high heat, and they’re also highly acid and stain resistant. It’s the perfect countertop material for a light, airy look without any maintenance. Create hygge through personal artifacts.Hygge is Danish concept for a feeling of cozy contentment and well-being. In a kitchen where you may have a lot of slick and hard surfaces, it might feel hard to bring that in. We created Hygge through the soft rug on the floor, and the tabletop items and ceramics collected by the clients over time. 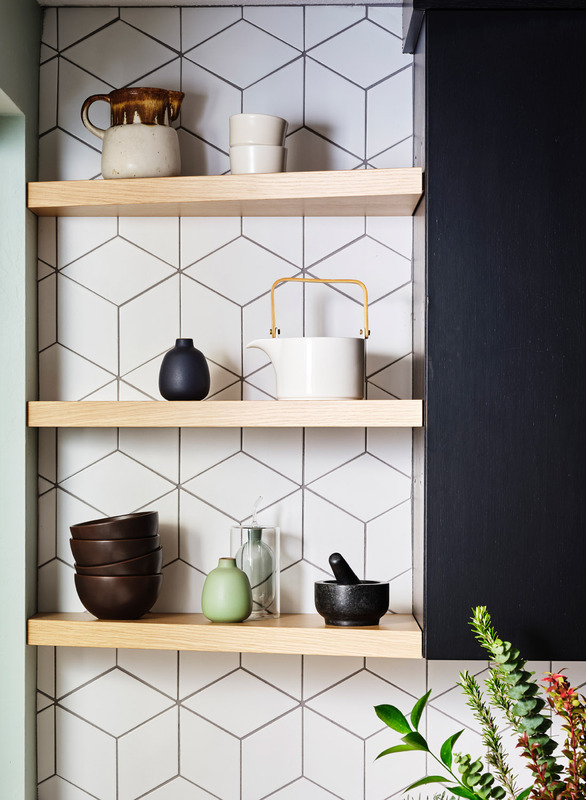 The display shelves on the wall and in the island help bring in these additional organic textures to create hygge in the kitchen.